The 33-foot-wide (10 meters) near-Earth asteroid 2014 EC will come within 34,550 miles (55,600 kilometers) of Earth's surface this evening (March 6) -- just 14 percent of the distance between our planet and the moon, which is about 239,000 miles (385,000 km) on average. 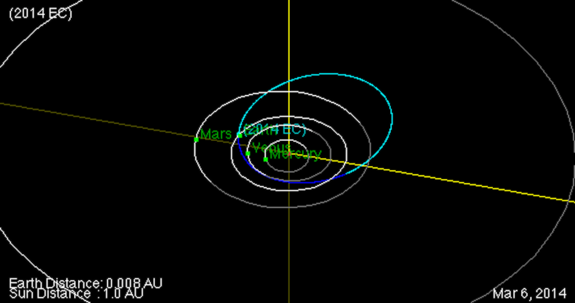 You can see a video of asteroid 2014 EC's orbit arount the sun here. "Moderately sized telescopes if you know where to look -- yes," Yeomans told Space.com via email. "The asteroid will reach an apparent magnitude of about 13.6 near closest approach."